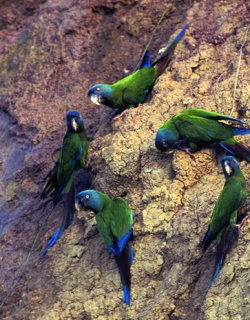 The Blue-headed Macaw is not usually found in flocks, but in pairs or family trios. Both adults medium-sized, mostly green, blue head, face bare, blue/grey and dark with fine lines of feathers; tail brown/red with green part way to tip. Bill grey/black. Eye yellow. As in adult but with shorter tail, horn coloured bill. Eye grey. Quiet, purring call while in flight; soft nasal slightly rasping notes; shrieks and squawks less raucous than Blue-winged Macaw. ML Media Collection Catalogue 17855, Blue-headed Macaw Primolius couloni, Parker, Theodore A., III, Huanuco, Peru, Jul. 16 1978, Cornell Lab of Ornithology. Parrots of the World, Forshaw and Cooper, 1977, 1989. An enclosure at least 3m (9.8 ft) long if indoors, with access to 15m (49 ft) outdoor flight if possible. Seed mix such as: sunflower, safflower, millet, canary, oats; pine nuts; dried mountain ash (rowan) berries; fruit such as: apple, pear, banana, orange, cactus fruits; vegetables such as: carrot, celery, green peas and beans, corn on the cob; green leaves such as: Swiss chard, kale, dandelion, chickweed; eggfood and calcium supplements during breeding; complete pellet for macaws. Provide lots of chew branches, sterilized pine cones, and other bird-safe chew items (ie: vegetable tanned leather toys); overhead misters or shallow water bowls for bathing. Diagonal nest box 22cm x 40cm x 30cm (8.6 x 15.6 x 11.7 in). Trapping for wild bird trade; forest degradation. E Peru to W Brazil; N Bolivia, east of Andes and south to 14 latitude. Found 150-1300m (492-4264 ft); upper tropical forests in disturbed or partly open areas with birds mostly occuring at forest edge along rivers, clearings and forested settled areas. Also in swampy habitats. Not very gregarious, instead found in pairs or threes. Possibly seasonally nomadic. Young birds seen with adults in April.